New dugouts, new scoreboard, new outfield wall, new sound system, and a new team. 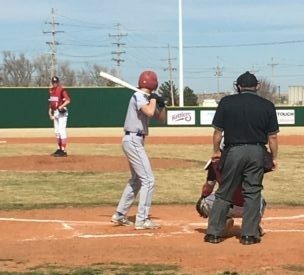 On a calm sunny day with temperatures in the upper 60’s, Liberal and Hugoton opened their baseball seasons on Thursday. The Redskins, one year removed from going 16-6 and winning a second straight WAC title, opened with wins of 10-0 and 9-2. In game one, Braxton Hyde took care of business on the mound. He pitched five innings with eight strikeouts and no walks. Hyde, who was 8-1 last year, allowed just one hit. Rodney Pando closed it out. . Elijah McCarter, Dylan Thompson, and Javier Bojorquez had two hits a piece. Bojorquez doubled and Pancho Terrazas tripled. The Skins scored three in the first, two in the third, and five in the sixth. The Redskins took game two 9-2. James Armstrong pitched four scoreless innings for the win. Terrazas, Warren, and Purdy pitched single innings with Warren and Purdy working scoreless frames. Shay Kerr and McCarter both had doubles. Hyde had two hits. The Redskins host the Woodward Boomers Thursday at 4:30.